$5 U.S. INDIAN HEAD GOLD COIN in 14KT GOLD DIAMOND PENDANT .80 CTS. AUTHENTIC U.S. $5 INDIAN HEAD GOLD COIN MOUNTED IN A HIGH QUALITY SOLID 14KT GOLD DIAMOND BEZEL .80 ..
High quality 14kt yellow gold earrings with U.S. 1/10 eagle coin. Hand-made twisted wire..
High quality 14kt yellow gold earrings with U.S. 1/10 eagle gold coin. Price inclu..
High quality 14kt yellow gold pendant with U.S. 1/10 eagle coin. Measures 30mm tall x 20mm wid..
14kt Gold Cuff-links with two 1/4 oz. Gold U.S. eagle 1/4 oz. coins. Price includes coins. Cla..
High Quality 14kt Gold Diamond Coin Mounting. This beautiful pendant contains 1.30 carats ..
High Quality 14kt Gold Diamond Coin Mounting. This beautiful pendant features .22 carats..
High Quality 14kt Gold Diamond Coin Mounting. This beautiful octagonal pendant contains 1.00 c..
High Quality 14kt Gold Diamond Coin Mounting. This beautiful pendant contains 1.30 carats of quality..
High Quality 14kt Gold Diamond Coin Mounting. This beautiful octagonal pendant contains 2.20 c..
High Quality 14kt Gold Diamond Coin Mounting. This beautiful pendant contains 2.80 carats of quality..
High Quality 14kt Gold Diamond Coin Mounting. This beautiful octagonal pendant contains a stun..
High Quality 14kt Gold Diamond Coin Mounting. This beautiful pendant contains 1.10 carats of quality..
High Quality 14kt Gold Diamond Coin Mounting. This beautiful octagonal pendant contains 1.10ca..
High Quality 14kt Gold Diamond Coin Mounting. This beautiful pendant contains 1.00 carats of quality..
High Quality 14kt Gold Diamond Coin Mounting. This stunning pendant contains 2.55 carats of high qua.. Designer high quality 14kt yellow gold fluted earrings with U.S. 1/10 eagle coins. Hand-.. Handsome solid 14kt gold coin ring with a genuine U.S. 1/10 oz. 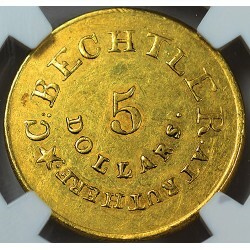 eagle gold coin. This high..
High quality 14kt Gold ornate coin mounting. This beautiful pendant will fit a U.S. $20 ..
High Quality 14kt Gold Diamond Coin Mounting. This beautiful pendant contains 1.37 carats ..
Two skilled German metallurgists, Christopher Bechtler and his son August, opened a private mint at ..
Beautiful solid 14kt gold diamond coin ring with a genuine U.S. $1 gold liberty head type 1&nb.. Handsome solid 14kt yellow gold coin ring with a genuine U.S. $ 2 1/2 Indian head gold coin, graded .. Handsome solid 14kt yellow gold nugget style coin ring with a genuine U.S. $ 2 1/2 Indian head gold .. Handsome solid 14kt gold fluted design coin ring with a genuine U.S. $5 gold Indian head gold coin.&.. Handsome solid 14kt gold coin ring with a genuine U.S. $5 gold liberty head gold coin. Thi..